To celebrate Roane Publishing's one year anniversary, they have decided to give their readers all the presents. 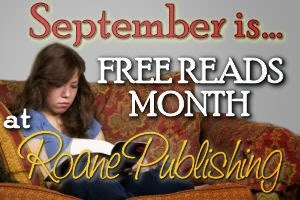 Each Monday for the entire month of September, Roane Publishing will release two free eBooks. No rules or requirements. Just free reads. Description: Everyone wants to be someone’s first choice. Rebecca is no exception. She’s been in love with Tyler forever, but he’s one of her best friends. She knows you never cross the friendship line; not if you want to stay that way. Too bad for meddlesome friends. Now, she’s stuck on a camping trip with a bunch of couples, and Tyler. Will Rebecca be able to bury her feelings and stay friends with Tyler, or will she sabotage everything including the Labor Day weekend? Description: Everyone wants a dragon until they have to feed one. Rory’s personal guard knows the little dragon is bursting with magic which could revitalize all the farmer’s fields, and still rid an old man of his aches and pains. Too young to defend herself she’s forced to run when the king discovers she could also be his source to eternal youth. Description: Sonny the Scoundrel must help Grandpap the wizard with Grandpap's newest money-making scheme—selling cats to a neighboring village with a vermin problem. Grandpap feeds a cat-grow potion to the cats in the expectation the cats will breed and grow at a rapid rate. But as the cats rid the village of mice and rats, a new problem develops—a plague of cats. Now the angry villagers want Grandpap and Sonny to do something about the cats overrunning the village before any further plagues erupt. But it is already too late. Description: Brodie Hartley—the true definition of a rugged rascal. A rascal who hadn’t been home in a long time, but when his friend Trey Cleary asked him to be the best man at his upcoming nuptials, Brodie hopped on his Harley and headed for North Carolina. Darby Cleary had always been more than a little infatuated with her brother’s best friend, only she was too young for him back in the day. However, Darby isn’t a little girl any longer; she’s a woman who wants a taste of Brodie Hartley. Her game plan for the pre-wedding activities? 1. Flirt with the man. 2. Seduce him. 3. If one and two don’t work, get him well lubricated and hope like hell Brodie wants a taste of her, too. Description: Happily mated Tiger shifter, Fhina has the Purr-fect life with her no-longer-cursed Wolf shifter husband and their brand new babies. So, why is it that life suddenly took a turn for the weird for her favorite cousin Tessa? And why did Fhina’s Magician ex-boyfriend and his gaggle of pixies suddenly appear in Tessa’s bakery. Description: Having a sister was something Harper Donaldson had only wished for in her dreams. When a letter came telling her she not only had a sister, but her new-found sister was coming to visit Holly, Montana in person within a weeks’ time, Harper panics. Chloe Summerfield grew up in a loving home with an adopted family, but always wondered who else might be out there. Given the right tools and a little bit of time, she found out she had a sister and has wasted no time arranging to meet her long lost sibling. Will the meeting be everything both women hope for?